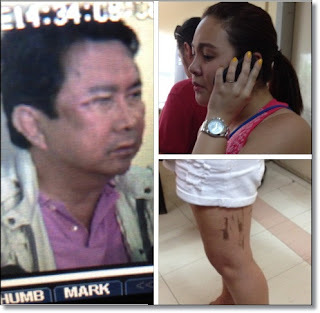 See Raymart Santiago, Claudine Barreto vs. Ramon "Mon" Tulfo Brawl video here. 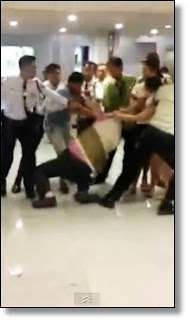 At least seven men, including actor Raymart Santiago and actress Claudine Barreto, ganged up on veteran TV host and Inquirer columnist Ramon "Mon" Tulfo , Sunday, May 6, 2012, at around eleven o' clock in the morning at NAIA3 Baggage Claim area.. The brawling incident occurred when Ramon "Mon" Tulfo took photos of Raymart Santiago’s wife, actress Claudine Baretto, “berating” a ground steward over a mishandled luggage. 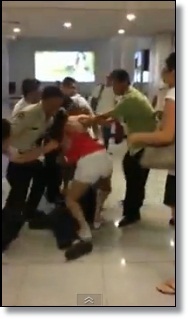 Ramon "Mon" Tulfo said he arrived at the Ninoy Aquino International Airport (NAIA) Terminal 3 from Davao via a Cebu Pacific flight when he noticed a woman giving a ground staff of the budget airline a vicious dressing down. Before the beating he received, Ramon "Mon" Tulfo's attention was caught by the ground stewardess who was on the verge of tears. He said he initially sympathized with the woman after learning from onlookers she had been complaining of “an offloaded luggage,” which has been a subject of critical columns he wrote before. He did not recognize the woman as Claudine Baretto until he walked toward the airline’s complaints desk. Tulfo pulled out his mobile phone and took photos of the scene, which he said would form part of a future column he intended to write, when a man from the actress’ group approached him. The man, whom he later recognized as Baretto’s husband, Raymart Santiago, “demanded to get my phone which I used in taking shots,” the columnist said, adding he refused to surrender his phone. Santiago continued to force Tulfo to give his phone to the actor when the latter’s companions came to his side, according to the columnist. Tulfo said he could not recall who threw the first punch because he was ganged up on. He said he was hit at his blindside as the punches kept coming. 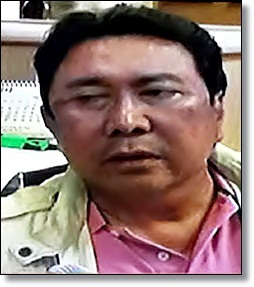 While trying to fight his way out, Tulfo said Baretto, who was nearby, repeatedly cursed him. He admitted that he might have hit the woman with a kick as he tried to fight back at his aggressors. “This is the real persona of an actress who is always portrayed (in the movies) as a martyr,” he continued, as he pitied the ground staff of Cebu Pacific whom Baretto allegedly berated. At the same time, Tulfo denounced the NAIA security personnel and the airport police for failing to restrain Baretto’s party as they were restoring order in the area. He said he already submitted himself to the authorities when they arrived and as they were sorting things out, “somebody lunged behind me and grabbed me by the neck.” The choking lasted a couple of seconds, and Tulfo said he could have passed out if it happened a few moments longer.